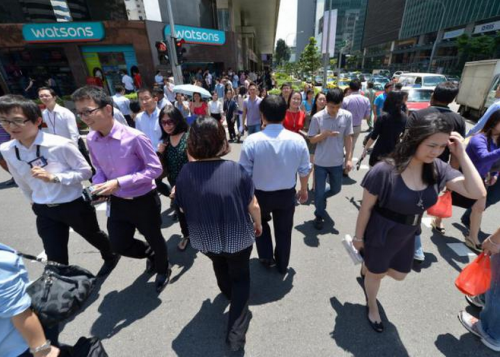 The Government aims to maintain the foreign share of Singapore's workforce at the current one-third level, at a pace that the country can accommodate. Responding to a question from MP Gan Thiam Poh (Pasir Ris-Punggol GRC) in Parliament yesterday, Manpower Minister Lim Swee Say said "this means that the pace of foreign workforce should grow broadly in tandem with the growth of our local workforce". Mr Lim told the House that overall annual foreign workforce growth has moderated from 144,500 in 2007 to 34,000 last year. The "significant foreign-worker growth slowdown occurred in all sectors", he added. Excluding foreign domestic workers, the employment of foreign workers in the services sector grew by 21,500 last year, down from 54,500 foreign workers hired in 2007. Similarly, foreign employment growth slowed from 36,000 in 2007 to 9,700 last year for the construction sector; and from a 42,000 foreign-worker growth to a decline of 5,400 over the same period for the manufacturing sector. Mr Gan had also asked about the projected number of foreign domestic helpers, caregivers and healthcare workers needed over the next 15 years, in view of the ageing population here. Citing projections from the Ministry of Health, Mr Lim said the number of healthcare professionals needed would increase from 46,000 in 2011 to 78,000 in 2030, while the staff strength of healthcare assistants and nursing aides would need to go up by about 9,000 over the same period. Meanwhile, the National Population and Talent Division expects demand for foreign domestic workers to rise to about 300,000 by 2030, to assist with caregiving duties at home and supporting families with the elderly and children.